Over the years I have given a lot of thought to fatherhood. I remember when I was in 7th grade, and I was reading Bill Cosby’s book Fatherhood. At the time my lab partner teased me about the book asking if I was going to be a father or something? Of course at that moment I said no. No, I don’t think I was looking at fatherhood way back then but it was a pretty funny book. The truth is that even with such dubious role models as Bill Cosby, Tim (the Tool Man) Taylor, Michael Keaton and Ray Barrone I was pretty sure that I did want to be a father even then, just not yet. *** I think that I should stop for a moment here and say that I don’t think of myself as a great father. I don’t even think of myself as a particularly good father. This is not one of those, “Look how good a dad I am” posts. I am just a dad who is trying to figure things out as I go. I think despite the questionable role models, or the lack of good role models on TV, I still wanted to be a father. I still wanted to have kids of my own. Why? Well I am not sure, but I did. The important part to me starts right about 1:13 when friends of Joseph start to question what is going on. We don’t all face the same things that St. Joesph did in bringing a child into the world. We don’t face God being the father of our children, but we all do face a fair amount of uncertainty. One of those uncertainties, will be the people that we count among our friends before we have children. Some of whom will question our choices, and some, as happens to Joseph at 1:54 when 23 people un-friend him, some of them will abandon us altogether. Looking back at it now I say, good let them go, I remember how that felt. And I am not saying it is going to be easy. That is another lesson learned from St. Joseph, some times being a father really isn’t easy. A personal example of that, one day before our eldest son was born we were told there was something wrong. So we had to drive over the mountains to Denver, and then once he was born. Because of a health condition we couldn’t go home again. It was a trying time, but that is nothing compared to what the Holy family had to deal with. They had to leave home and to go to a crowded city, where there was no place for them. Once they get there, having their baby be born in a stable. Then in the middle of the night being told, by an Angel, that you have to leave now. Not to go home, but go even further away to Egypt. It was a good thing that Joseph was a carpenter and could find work just about anywhere. That brings me to the reason I chose the title for this post. Most of the time, in today’s society if you see a father portrayed at all, he is portrayed as a bumbling idiot, who some how manages to make money so his family can survive. He is often in trouble, with either his wife and some times his kids, and normally is the laughing stock for all of us. Yes, these are sitcoms, but are there really any good father figures on TV anywhere else? In this we could all take a lesson from St Joseph. It is a hard lesson to learn especially in today’s culture, Being a good father is not about being the center of attention. It is not about your friends, either the ones who have stuck with you, or the ones that have abandoned you. Even when St Joseph probably had something to say it was not recorded. And yet he was still an effective father. While it is unclear when he died, it is generally accepted that St Joseph died before Jesus was very old. Despite that, he spent enough time with him, teaching him and being a father to him, that when he did die Jesus and Mary were able to survive on the skills learned from his father. And yet, we never really hear about that. We don’t have any records or youtube videos of the afternoons spent in the shop working. We don’t have any accounts of Joseph spending time with his son, teaching how to play ball, or fix the house up or use the tools. We have to assume that he was an effective teacher because Jesus was also known as a carpenter, and known to be good to his mother. So Today I think about St. Joseph. He is the role model that I want to follow. I hope that I am managing to do a good job of it, but I am likely not anywhere near as effective as he was. Saint Joseph, I come to you with my concerns for the welfare of my children. I recall your anxiety when, to your surprise and Mary’s, Jesus was not among your relatives and friends on your return from Jerusalem. I too worry about my children. Many dangers surround the youth of today. Sometimes, in my loving concern for them, I may seem to them to be difficult or even harsh. Help me to remove the barriers that may come between my children and myself. I love my children and desire good and wholesome things for them. 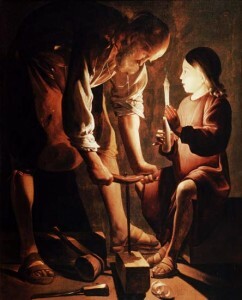 Good Saint Joseph, watch over my children and inspire me to know how to speak and act in love. 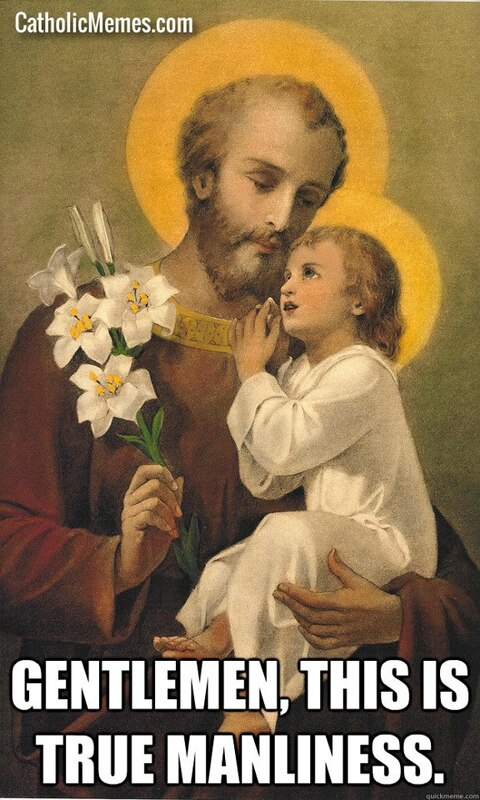 Saint Joseph, foster father of Jesus, pray for me. Amen.